Katherine Fowler went to boarding school as a young woman. It was in this environment that she began to cherish her interactions with the other women around her. There, away from the prejudiced judgements of men, she began writing poetry about those new found friendships. Her connections with other women became particularly important when she married Colonel James Philips, a man almost forty years older than Katherine. Soon after, she formed the Society of Friendship where she and a small group of women wrote poems of love and friendship to one another. Each member took on a nickname--Philips became known from that point on as Orinda. She began writing to her friend Mary Aubrey (Rosania), but later wrote more to Anne Owen (Lucasia). Ladies, forming this kind of a group would be a great way to expand your friendships. You can use Philips's letters and poems as a place to begin--and then watch your own poetic voice emerge. In reading her work, you will see how Philips uses images of our sighs, tears, and breath to imply friendship. She suggests a connection between the minds and souls of two friends, and such a connection is not easily broken. You might sense some of the worry behind her discussions of love--do not be uneasy yourselves, but do be aware of why Philips feels this way. Although you may sometimes feel trapped by society, Katherine Philips will always serve as a reminder that friendship is an Eden within that cage. 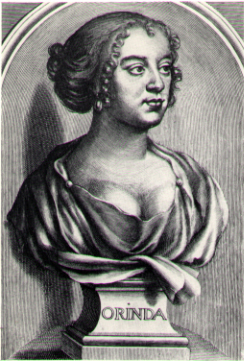 Would you like to read some of Katherine Philips's poetry?